When we mention to guests that Biltmore Estate in Asheville decks its halls with bows of holly for the Christmas season, we’re talking 175,000 square feet of halls, living rooms and dining rooms and gathering rooms, bedrooms and more, completely decked out in Christmas grandeur. When the annual tree raising ceremony at Biltmore Estate happens (at 10am on November 1 this year), it’s a 35-foot Christmas tree for the seven-story banquet hall inside Biltmore House, which also happens to have a massive fireplace that’s actually three fireplaces in one. Santa definitely has his choice of chimneys to come down at Biltmore — there are 65 fireplaces in total. As you can tell, Biltmore does Christmas in a big, big way. 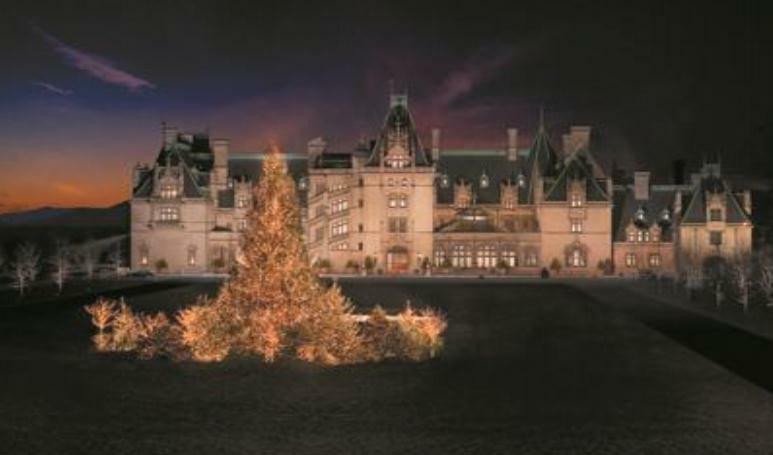 And you can check out their spectacular Christmas decorations during the day and in the evening at Biltmore as part of the Christmas Candlelight Evenings. Our guests can purchase two-day tickets for the price of one at a discounted rate of $49 here at the Inn on Mill Creek Bed & Breakfast, and the tickets can be easily upgraded to add a self-guided tour of Biltmore House in the evening for just $10/person. See the fireplaces glowing and the lights on the decorated trees twinkling, hear beautiful live music, and get a taste of the coziness that the Vanderbilt family and their cherished guests experienced during an evening at Biltmore during the Christmas season. We’ll help with all the arrangements, and can even assist with making reservations for dining at one of Biltmore Estate’s great restaurants before or after your evening tour. Biltmore Christmas Candlelight Evenings are available from November 9 through December 31, with the exception of November 20, November 22, December 24, and December 25. More about Christmas at Biltmore: Each year, Biltmore picks a theme for its Christmas celebration. The theme for 2012 is The Art of Christmas, so when you visit Biltmore, be sure to take a look at pieces of artwork in each room to see how it has inspired that room’s Christmas decorations. And don’t miss the glassed-in Conservatory near the Walled Garden — it’s a year-round gardening oasis and you’ll find plenty of decorations there as well!